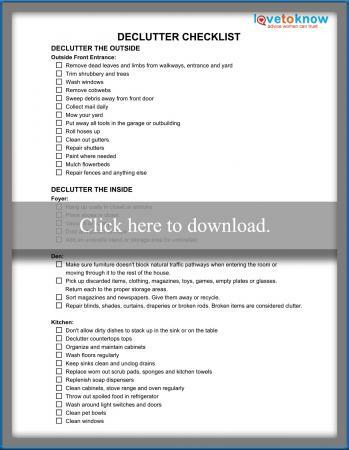 You need a free declutter checklist to get your house organized. Don't let the task overwhelm you. It's easy once you get started. 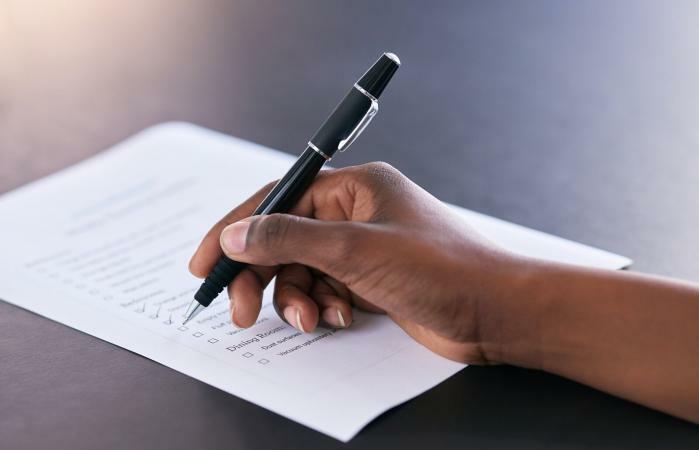 The list below is a tool you can use to get started today. You can check off each item and before you know it, your home will be a clutter-free zone. Use an Adobe printable guide for help, if needed, to download and print the list. Once you make the initial run through, maintaining your clean home will be easy. Start outside your home. This will set the mood for what to expect inside. When you go home at night and find a neatly trimmed yard and welcoming front entrance, it won't matter how rough your day was. You'll be able to rest and relax in a clean and organized. Once you have the outside decluttered, start at the entrance and work your way through the house room by room. You want the foyer to be spotless and greeting area for all who enter. This area should be inviting and energized. This is where the chi energy pools and then disperses into your home. Avoid tossing mail and keys on a foyer chair or console table. Make sure that the walls are in good shape, such as a fresh coat of paint. The front door should be free of scuff marks and dings. The den is a respite and gathering place for your family. This area should have a relaxed ambiance. Provide several types of lighting, such as table lamps, floor lamps, torchiere lamps, recessed lighting and wall schones. Dust regularly and don't forget house plants. Avoid open shelving that creates poison arrows and other inauspicious forms of clutter. The kitchen is vital to family health. How you cook the meals is just as important as the ingredients. Clutter will create negative energy that can transfer to the food preparation. The laundry room can impact the family's wealth. Just as a bathroom is filled with inauspicious waste water, so is the laundry room. The bathroom takes in clean water but generates waste water. It's vital to health and wealth that you keep this room clean. Follow the Declutter Checklist to ensure you do everything necessary for a feng shui bathroom. You can improve your sleep when you declutter your bedroom. Clutter creates chaotic energy that is counter productive, especially in a bedroom. If you're attempting to work in a cluttered office, you will find your efforts meet resistance and obstacles. The moment you declutter your office you'll see an improvement in your work process. Using this free declutter checklist, you can achieve immediate results. Chi energy is in all living things and needs to be free to move through your home without being bogged down by clutter and dirt. Stagnant chi can make you and your family ill. It can stop the flow of money and opportunities. Not only does it make good feng shui sense to keep a clutter free home and vehicle, it also will make you feel better and help you to be more efficient. You'll benefit by being more productive and having more free time to spend with your family.